We're almost midway through March (already?) and winter is just about gone, but before winter goes away, we've still got two more weeks of Digital Digest for the winter season! We've got all of your regular features this week, as well as a "double feature" on our reviews, with The Lucille Ball Specials - Lucy Moves to NBC and Picker Sisters - Season One. Let's get started! It is another slow news week, but we've got a few things of interest for you. First, as we all know, MPI's long-awaited release of My Living Doll - Volume One is finally being released in a little over a week (look for our review of this in the next few days, by the way; it is a great release! ), complete with eleven episodes of the series, but what about more episodes? Well, according to this, the original production company is looking for quality additional episodes for a future release. The big question is, will they actually find those other fifteen episodes? As far as we know, the "search" has been on for years, and it doesn't seem that much progress has been made in this quest thus far... but we hope that changes! By the way, it should be noted that the article linked here, as well as much of the publicity for the release of the first volume of the series, has one minor error. The release does indeed contain eleven episodes, but it is NOT the first eleven episodes, but rather a collection of eleven episodes scattered among the first twenty two episodes. Of course, we'll have all of the details in our review! Shout! Factory has been steadily releasing Designing Women, with the series almost (but still one season to go) coming to completion on DVD next month with Designing Women - The Complete Sixth Season (which, by the way, we just received a review copy of and will have a review posted very soon), but for fans who want "just the best," Shout! Factory has a very inexpensive release in the works with Designing Women - 20 Timeless Episodes. The two disc set is to be released on June 5, but exact episode contents aren't known just yet. Speaking of Designing Women, over a year ago, Mill Creek announced (and subsequently canceled) a release of spinoff series Women of the House, which starred Delta Burke. But is something inevitably going to come of this release? As of right now, it seems that the short answer is no; however, the long answer is that Mill Creek had indicated in the past few months on their Facebook page that a release of the series may not be totally abandoned. So we'll take a wait and see approach and hope that something develops from this! That isn't all that you will find on the Mill Creek page on Facebook, though. They have also mentioned that additional seasons of Grounded for Life, which was not included in the upcoming batch of releases from the Carsey-Werner library, are in fact coming... but to stay tuned for exact details! Tuesday (March 13) is, by all means, one of the most disappointing release dates we've seen in a long time. There are two (technically eight, but seven are just multiple season releases of the same series) things that we'll mention, though, the first being Picker Sisters - Season One, which we have a review of today in Digital Digest. The other releases are a ton of releases (all seven seasons, in fact) of the animated series, Bobby's World as Amazon.com CreateSpace MOD items, but you'll have to buy each season (1, 2, 3, 4, 5, 6, and 7) separately. Beginning in the early '50s, Lucille Ball began her career on CBS with I Love Lucy, and maintained a starring role (always playing Lucy) in a series on the network for several decades to follow, until the mid '70s when she reduced her role to starring in just a few occasional specials on the network. But just before the '80s, there really wasn't much else that CBS could do with Lucy, and there was another network out there that was seriously struggling and needed all the help that it could get. That network was, of course, NBC, and in 1979, Lucy made her big move to the network that was "proud as a peacock" in a deal that would put her in charge behind the scenes. Needless to say, in the long run, the arrangement didn't quite work out. We all know Lucy as the star of three (or four depending upon how you count The Lucy-Desi Comedy Hour) CBS series spanning over twenty five years, but there really isn't anybody who truly remembers her days at NBC. NBC, in fact, was on the verge of hitting their stride just a few short years later, but that stride didn't include Lucille Ball. But with high expectations of what she could have done for the network--and if it were only a few years earlier, it probably would have turned out much different--NBC brought in the queen of comedy with great fanfare, giving her an entire special to hype the big move to NBC and her getting acquainted with her new co-workers, new digs, and making her transition into a whole new decade where things weren't quite the same as her heyday of television where new territory, political tensions, the sexual revolution, and controversy were all constantly being encountered. Lucy Moves to NBC is a star-studded feature which stars Ball of course, but also features many of the other "stars of NBC" welcoming her to the network, including Bob Hope, Johnny Carson, Jack Klugman, Gene Kelly, and, oh yeah, since this was 1980, Gary Coleman, of course! The special begins with Lucy moving in to her new office and meeting her new boss, which as we would all expect, it would have been NBC president Fred Silverman. But not quite. How do you work the network's most adorable kid into the special? You make Gary Coleman her boss! Gary Coleman, introduces himself to Lucy as the serious, hard-working guy who has been in television "his entire adulthood," proposing that they use her immaturity and newcomer status to television to do the best for NBC. In this introduction, Lucy also gets to meet all of her new fellow NBC stars as well, but unlike Gary Coleman, they're not running the network. As the special progresses, Lucy encounters an old friend, Gale Gordon, and works with him to devise a new pilot for NBC, which we see in the process of development all the way through to the final product (which is somewhat odd, because the special suddenly evolves turns into the actual pilot towards the end), a musical comedy starring Donald O'Connor and Gloria DeHaven, along with Robert Alda, Ruta Lee, Doris Singleton, and "introducing" (he really didn't do a whole lot after this) Scotty Plummer. The entire special has a runtime of 1:13:36. Normally, we don't cover special features until a bit later in our review, but they are very much integral to this release, so we will cover them now. As for the special itself, it begins with a new introduction (1:25) from Ruta Lee and Jack Klugman, as they remember the special. There is also a retrospective looking back at the special (21:59) with Jack Klugman, Ruta Lee, Hal Kanter (who has recently passed away), Doris Singleton, and others. It is a mostly positive look at both the special and the overall legacy of Lucy herself. Lucy's move to NBC didn't actually produce any hits for the network, but it did introduce one pilot in 1981 (in addition to the one presented in the special) that was actually directed by Lucy, Bungle Abbey (27:51), a somewhat quirky (but fun) series about monks in a monastery who were not your ordinary monks, at all. The pilot stars Charlie Callas, Guy Marks, Gino Conforti, Graham Jarvis, Peter Palmer, and (of course) Gale Gordon. There is also an introduction to this pilot from Gino Conforti (1:27) where he admits the very obvious: this series would have never worked, and in fact, it was a challenge to even write enough material just for the one pilot episode, but it was still a very fun pilot to do, and I think many people will enjoy watching it. It feels a bit like a sketch from the end of an episode of Saturday Night Live that was made a bit too long, but it was a nice effort at the very least. "Let's Talk to Lucy: Bob Hope" (9:25) is a very brief 1964 radio interview featuring Lucy interviewing Bob Hope, which is particularly appropriate for this release, as Bob Hope was one of the early big stars of NBC. I say "very brief" because Bob Hope only takes part in the first few minutes of the interview. Much of the interview features Lucy talking to her husband Gary Morton about National Children's Book Week and keeping a family strong, where she talks about keeping her husband and kids together through education and reading (notice that the "other guy" that she had been married to before is not mentioned... at all... but that is OK). Finally, "Lucy on the Bob Hope Special" (10:37) is a segment from a Christmas special featuring Bob Hope and Lucy. There is no indication of exactly what year this aired, but it appears to be from the late '70s. The DVD comes packaged in a standard DVD, with packaging that matches all of the other releases of The Lucille Ball Specials from MPI. 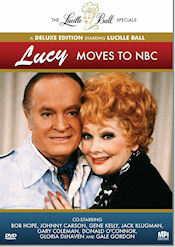 The cover artwork features Lucy and Bob Hope, while the back features photos of Lucy with Jack Klugman and Johnny Carson. All of the special features are also listed on the back, along with a description of the special. The single disc has artwork that is identical to the cover artwork. There isn't a whole lot to the menus on the DVD. The main menu has the theme music from the special playing, and gives you the option of playing the special, playing it with the special introduction, special features, and an option to turn on subtitles. Chapters are placed throughout the special. The video and audio quality of the release is, to say the least, not all that great. Of course, it is important to consider that this was from an era where everybody seemed to cut corners everywhere to save money, but just before producers began to see the value in creating a product of higher quality... somewhat of a "lull," I guess. The transfer almost looks like a decent quality VHS transfer, but it is by no means a disaster. The audio is a bit low, but I don't think most fans will be bothered. Like just about every other MPI release out there, the release DOES contain English subtitles. It is great to see that MPI, one of the "little guys" out there, almost never neglects this important part of their releases. I'll admit, this was probably one of the weakest points of Lucy's career (which sadly only got worse when she moved on to ABC several years later with Life with Lucy, a series which was not one of her proudest moments), but still, it is, in fact, Lucy, and an important part of her legacy. Out of all of the specials that MPI has released, this was definitely the least interesting one, but I am still glad that it made it to DVD, and I know that every Lucy fan will definitely want to see this. It helps even more that MPI didn't just slap this together just to get it out, but actually made a great release that is up to the high standards that they have set for pretty much all of their releases of anything Lucy related. If you have yet to pick up any of these specials, though, this probably is not the one that you'll want to start with. Some of the earlier ones brought back some of the Lucy style antics that fans were used to, and are likely to find more interesting. But don't get me wrong on this release. It is a great release, and fans of Lucy are definitely not going to want to pass this one up. Starring best friends and renowned interior designers Tracy Hutson and Tanya McQueen (Extreme Makeover: Home Edition), Picker Sisters reaffirms the classic saying "one person's trash is another's treasure" by following the design duo as they crisscross America in search of rare relics and materials with which to create stunning pieces for their Los Angeles home decor pop-up shop. With keen eyes for style and intuitive design instincts, Hutson and McQueen travel far and wide to find jaw-dropping bargains on any interesting materials they discover before driving back to California and transforming them into unique pieces that will fetch top dollar. Whether it's a tarnished fuel tank sitting in a junkyard, mangled barbed wire or rusty tire wheels, the Picker Sisters negotiate the right price for the belongings of some of the country's most interesting people. Once back in Los Angeles, Hutson and McQueen work with their contractor, Alan Luxmore, to realize their design vision and create beautiful furnishings for shrewd Los Angeles buyers looking to decorate their homes or offices. Picker Sisters premiered on Lifetime on August 2, 2011. The first season ended on September 6, 2011. The series is produced by RelativityREAL for Lifetime Television. RelativityREAL's Tom Forman (Lifetime's Coming Home, creator of Extreme Makeover: Home Edition) and Josh Bingham (Obsessed, The Two Coreys) serve as executive producers. Rob Sharenow, Gena McCarthy and Sandy Varo Jarrell of Lifetime Television also executive produce. RelativityREAL’s Brad Bishop (Find My Family) is co-executive producer. The 2-disc set contains all 8 episodes from the first season (2011). It comes in an Amaray movie-style case. Tanya and Tracy are airbrushed on top of a pile of items on the front cover. A synopsis of the series, a listing of the show credits and the DVD specs are provided on the back of the cover. There are two tiny photos of Tanya and Tracy. A large series logo is at the top. Tanya and Tracy are pictured on the spine of the case. There's just blank space inside the case. It would have been great if they included an episode guide somewhere. The discs have the same photo of Tanya and Tracy as the cover art, although it is a bit cropped. They have the show logo and episode titles printed on them. The main menu opens with a brief montage of video clips that you see in the opening credits of the show. Some instrumental music is played in the background. This leads to the main static menu. It features a large photo of Tanya and Tracy (the same one as the front of the packaging), with clouds in the background and the show logo at the top. There are options for Play All, Episodes and Subtitles. There's a yellow arrow next to the option you highlight that turns white upon your selection. When you choose Episodes, it takes you to another menu that has a screenshot of Tracy and Tanya from one of the episodes. A different photo is used on each disc. The episode titles are listed vertically in white text. Tracy is pictured on the subtitles menu, where you can turn on/off the English and Spanish subtitles. Chapters are placed at the appropriate places. As you might expect from such a recent show, the video and audio quality is excellent. The scenes are mostly outdoors and look beautiful as they travel the South before heading back to California. They are presented in widescreen format. If you want high definition episodes, they can be found on Amazon.com . The total running time of the 2 discs is approximately 3 hours, 47 minutes. All of the episodes appear to be unedited, with running times of 20-41 minutes. Five of the episodes aired in a half-hour format. Three episodes aired in an one-hour format. The audio is a Dolby Digital 2.0 Stereo track. Subtitles are available in English and Spanish. Texas, Here We Come (8/2/11) (20:19) - Tanya and Tracy hit their home state of Texas on a quest for amazing junk. Meanwhile, the pressure's on Alan to get the store ready back in L.A. Once the girls fill their trailer with rusty treasures and an entire house-worth of wood, it's time to haul it back home for Alan to transform it all into fancy furniture and get those doors open. The Promise of An Empty Trailer (8/2/11) (20:15) - Tracy and Tanya head to Louisiana on a mission to pick the coolest Cajun junk. A sugar cane farm and a historic sugar mill yield a bounty of raw materials that the girls can't wait to transform into gorgeous furniture and lighting fixtures. But, when they ship 1500 pounds of chain back to Alan, it's a bit more than he can handle. Motorcycles and Meat Sauce (8/9/11) (41:39) - Tracy and Tanya brave the swamps of Mississippi and discover a slew of gems, including a vintage Harley Davidson that they hope will become a piece worthy of the coolest customer. Back in LA, Alan makes it his mission to deliver the most stunning transformations yet. Don't Be a Pecky Head (8/16/11) (20:12) - It's back to Cajun Country where Tanya and Tracy seek out more unique pieces to transform into beautiful home decor. Back in LA, Alan struggles to understand the girls' vision when he receives a shipment of unique cypress wood. Then the girls return, and sales are picking up, but it's not always easy to let their passion projects go. The Dos and Don'ts of Life on the Road (8/23/11) (41:30) - Tanya and Tracy explore the Deep South, picking their way through crane yards, boat yards, and backyards. They unearth so many fantastic industrial and vintage finds that their trailer is full after only one day. So they ship it all home to Alan and call to give him direction on how to transform it into fantastic furniture, but his misinterpretation of their vision could lead to design disaster. Pickin' For Peanuts (8/30/11) (20:09) - Tanya and Tracy sift through the attic of an old peanut shop, the mountains of metal in a junkyard, and the hallowed halls of a defunct hospital. In LA, Alan contends with the hefty weight of the purchased pieces as he converts them into high-end furniture. Must Love Rust (8/30/11) (20:10) - Tracy and Tanya delve back into the South and find inspiration everywhere they turn, including the eclectic garden of a sculptor and an unused grain silo. Alan doesn't flinch when the girls ship him an entire silo, but turning that silo into the chairs the girls envision becomes more of a challenge than he expected. It's a Sign (9/6/11) (41:36) - Tracy and Tanya enjoy their final foray into the South, but push the boundaries of their budget when they find a multitude of amazing objects. A roadside sign strikes a chord and offers a rusty reminder of how far their business has come. Back at the workshop, Alan buckles down to put his stamp on the ambitious projects and deliver the goods to the girls. The bonus material is additional footage and can be found on Disc 2. Tanya is pictured on this menu. There are 17 different scenes available. You can play them all together or individually. There's no indication which episodes these additional scenes are from. The additional footage runs nearly 30 minutes. I first became a fan of American Pickers when History's sister channel Lifetime began airing it in December 2010. I think it was only natural for Lifetime to attempt their own similar show. Although it's not a spin-off, it has the same elements of American Pickers and American Restoration. If people are expecting it to be the same as American Pickers, I think they will probably be a bit disappointed. Picker Sisters airs on Lifetime, so the show is definitely more geared toward women in the 18-49 demographic. It could also appeal to men who probably won't mind watching two cute women in short shorts and boots. The focus with this series is really not about picking items and selling them for profit. They are buying more scrap items that Mike and Fritz from American Pickers would never consider and turning them into one-of-a-kind items. I don't think Tracy and Tanya are great negotiators. They tend to overpay for items and reach their budget quickly. For what they may lack in the knowledge in the value of items, they make up for it with their style and design talents. It would be interesting if these kinds of unique items really sell for what they are asking. This type of business doesn't seem like it would very profitable with all the costs of gas, transportation and hauling costs, labor and materials, lease for the store, etc. It would never work as a three person operation like they depict on the show. I haven't read any news on whether Picker Sisters will be returning for a second season. The show averaged around 1-1.2 million viewers and a 0.3 18-49 rating for the few episodes I found. These seem like respectable ratings, but they are a little low in the 18-49 demo. If the show doesn't return for a second season, at least there's this decent DVD release that includes nearly 30 minutes of additional footage. I think the show could use a little tweaking if it returns for a second season. All of the episodes should be in the one-hour format. The 30-minute episodes (actually about 20 minutes with commercials) feel too rushed and lack the detail of the longer episodes. They could also provide more history and background story on the items they are picking. I feel like I'm learning something when I'm watching American Pickers, but they don't use the same information boxes on Picker Sisters. There's also a little too much focus on the picking and not enough minutes devoted to the actual rebuilding process of the crazy and unique items they are creating for their store. The Andy Griffith Show Rerun Watchers Club - This week, we take a little trip down to Mayberry, NC for a website that will bring you everything that you ever wanted to know--and more--about one of television's iconic series. The Andy Griffith Show Rerun Watchers Club, while it is certainly a club, is more than JUST a club. The website features all of the information that you want to know about the series, but it also allows the series to "live on" into the current era. On the website, you'll of course find the basics, such as an episode guide (which also includes a searchable database, by the way), photos, audio, a message board, cast biographies, and frequently asked questions. But the site goes much further than just that. Among the more unique features that you'll find at this website are information about upcoming events for fans of the series, a podcast (seriously, who could have ever envisioned a "podcast" in the '60s? ), a thorough "bible study," fan fiction, interviews, and (even if the particular pages are a bit dated by now, as the pages reference using things like Windows 95 and AOL!) some Java games for the series. All in all, it is a fun website to visit, and is certainly one of the quintessential websites for fans of the classic series.